November 16th Luncheon: Judicial Watch’s Mark Spencer! We’re so excited to share that our November 16th speaker is Mark Spencer, the Southwest Projects Coordinator for Judicial Watch. As you know, Judicial Watch, through Freedom of Information requests, was instrumental in uncovering the fact that Hillary Clinton was using a secret server while working as the Secretary of State under President Obama. Spencer facilitates investigations, development and community outreach, media relations, FOIA requests and litigative support for the non-partisan non-profit government accountability group. We certainly hope that you can join us! And hopefully we’ll be celebrating a great big presidential win! Keep your fingers crossed, and PRAY! Spencer currently serves in a chaplain capacity for the Republican Party of Maricopa County and the Usual Suspects (a non-profit retired police motorcycle club. 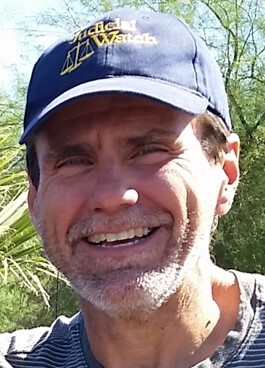 Mark Spencer has lived in Phoenix Arizona since 1975, and was the top overall police recruit from the Phoenix Regional Police Academy in 1987. While still a sworn first-responder, he partnered with F.A.I.R. (Federation for American Immigration Reform) and Judicial Watch in reference to front-line law enforcement perspectives on illegal immigration and government corruption. For fourteen years, Spencer was an executive board member of the largest police association in Arizona, the Phoenix Law Enforcement Association (PLEA). His role as the voice of the largest police association in Arizona garnered him the title as being one of “three of the most polarizing figures in Arizona politics” by the Phoenix New Times in 2011. His retirement from the Phoenix Police Department in January 2012 ended a 25-year career in which Spencer and the PLEA team cultivated powerful community partnerships and facilitated unprecedented bipartisan support for rights of Arizona law enforcement. Spencer has been interviewed by local, international (CNN), and national (Fox National News) cable news outlets, has been quoted in numerous print publications (The New York Times, The Washington Post, The Nation, The Arizona Republic, Phoenix Magazine) and has participated on radio talk shows across the country: topics discussed included illegal immigration, police suicide, border violence, and police management pension violations.